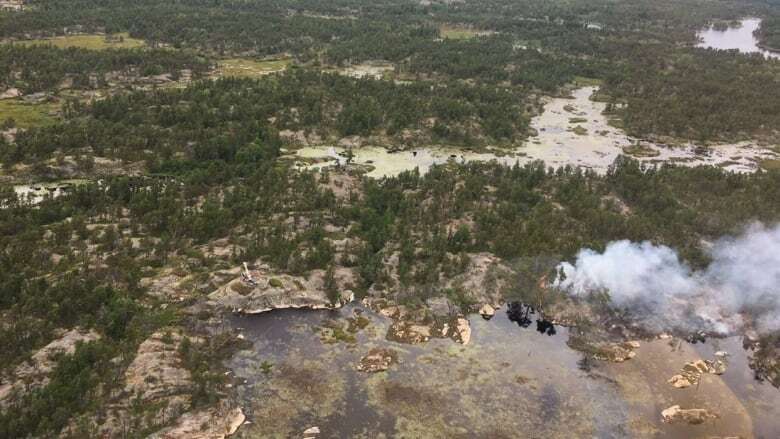 There were no new fires in northeastern Ontario reported by the Ministry of Natural Resources and Forestry on Sunday, but crews continue to battle 39 active forest fires. Twelve of those fires are not yet under control, including the one known as Parry Sound 33. Ontario's forest fire information map showed Sunday morning the fire had grown to about 8,224 hectares in size. "Priority remains along the northeast side of the fire with fingers extending towards the CN rail line, as minimal movement occurred across the tracks. Minimal growth along the southwest portion of the fire occurred," the MNRF said. "Hose lay and containment will resume along the northern portion as crews will look to secure that area. The southwest winds are expected to continue tomorrow, possibly bringing heavy smoke conditions periodically into surrounding communities and along Highway 69." Jim Rook, the municipality of Killarney's emergency manager, said he'll be visiting the ministry's temporary firefighting headquarters in Britt, about 70 kilometres north of Parry Sound, on Monday. "It will be a fair time, I think, before we're all happy with [the situation]," says Rook. "But they've put all kinds of resources at it, which is great." "I think things are now moving in the right direction. I must admit though that Mother Nature has a way of humbling us," stated Rook. 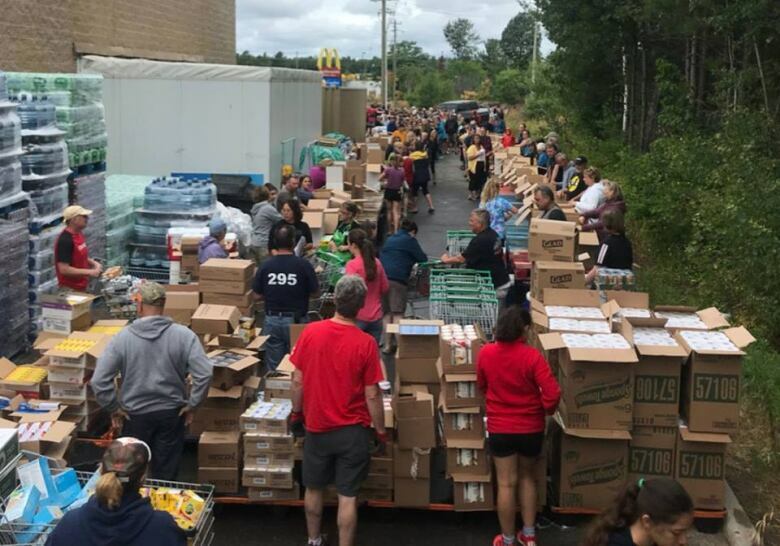 In Parry Sound, area volunteers stepped up over the weekend after the MNRF contracted a food order from the Sobeys grocery store in Parry Sound. With firefighting crews set to arrive in Britt last Friday, store owner Matthew Derouin needed extra hands to help pack the goods and ship them out early Saturday.​​ He says the initial order totalled over $20,000. "It ended up being well over 200 people," said Derouin. "It was just incredible." He also described what goes into a "48-hour kit" of food, like the ones sent to forest firefighters in Britt. "Each 48-hour kit supplies a four-man frontline crew for two days," Derouin said. "Mostly high-protein meals, things that will keep them fed and their energy levels high. We definitely sent out some striploin steaks and centre-loin pork chops. They've got to have those meals with the work they're doing." Derouin added it all must be "very strategically packed ... there's not a lot of room in these boxes for the amount of food that's going out." A total of 34 kits were sent out Saturday, equal to two days' worth of food for 136 frontline workers. Derouin said an additional 15 to 20 kits will be shipped out on Monday. Grundy Lake Provincial Park was evacuated over the weekend, with about 800 campers having to leave. "We hope to reopen the park as soon as it is safe to do so," Ontario Parks states on its website. "We will be reassessing again on July 30 if further cancellations are required." 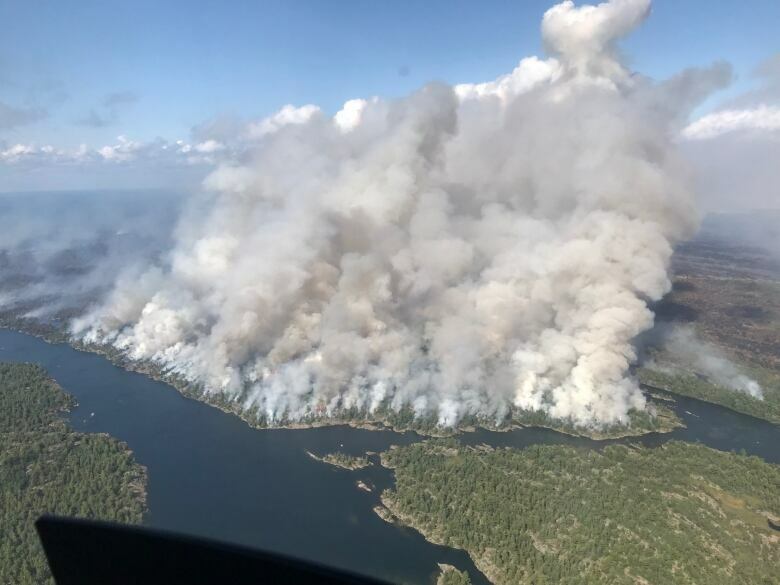 Below is information on some of the other fires in the northeast, including the massive one still ongoing in Lady Evelyn-Smoothwater Provincial Park. North Bay Fire 072 remains at 27,579 hectares and is listed as not under control. A little bit of smoke was observed on the fire later in the afternoon and we anticipate that will increase over the next few days as the weather returns to seasonal values with temperatures reaching the mid to high 20s. There are 11 helicopters assigned to this cluster. Crews made solid progress on all fires today. North Bay 62 was deemed under control this morning. On North Bay 42, crews worked on the north side today and made good progress. North Bay 025 is also under control. Good progress continues to be made on all fires in this cluster. Pembroke 5 continues to exhibit minimal fire activity. Since yesterday this fire is being held at 37.5 hectares. Pembroke 6 showed very little growth today. Crews are now fully established on the south, west and east flanks of this fire. Crews are still working to contain the 697 hectare fire. Being held at 72.5 hectares, crews on Pembroke 7 are working toward the centre of this fire, expanding the control line.